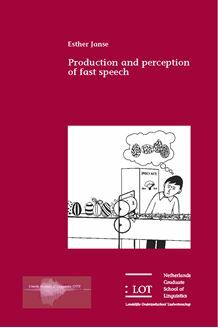 This thesis reports on a series of experiments investigating how speakers produce and listeners perceive fast speech. The main research question is how the perception of naturally produced fast speech compares to the perception of artificially time-compressed speech. Research has shown that listeners can understand speech at much faster rates than they can produce themselves. The current study attempts to answer for this discrepancy and addresses the following questions: Why is speech intelli­gibility relatively unaffected by time compression? How do segmental intelligibility, prosodic patterns and other sources of information contribute? Does the intelligibility of synthetic speech suffer more from time compression than that of natural speech, and if so, why? Whereas artificial time compression of speech is normally conducted in a linear way, production studies on normal and fast-rate speech have shown that speakers compress some parts more than others. This study investigates whether modelling the temporal pattern of artificially time-compressed speech in accordance with the temporal pattern of natural fast speech improves intelligibility and ease of processing over linear compression. Furthermore, it is investigated whether listeners find artificially time-compressed speech more difficult to process than naturally produced fast speech. The findings are considered in relation to current models of speech production and perception. This study is of interest to phoneticians, phonologists, and psycholinguists, as well as researchers working in the domain of speech technology.